Prepare for summer festivals with a crochet beaded bag to hold all your necessities while on the go. Crochet one to match other accessories in your wardrobe. 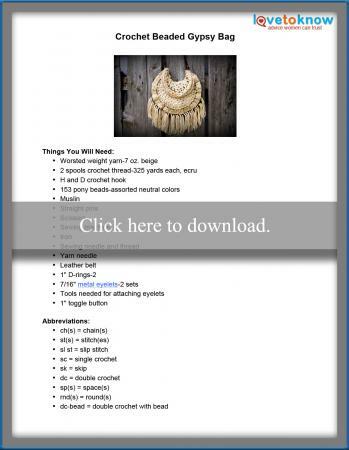 Adding beads right into your stitches as you crochet this beaded gypsy bag will eliminate extra steps and finishing work. While the completed bag may appear complicated, the pattern is simple, easy, and suitable for a beginner to crochet. This bag pattern was constructed using a strand of worsted weight acrylic yarn and two strands of cotton crochet thread. The thread not only adds texture to your bag but also provides strength that will prevent your bag from stretching when filled. Click on the pattern image to download the free pattern. The Guide for Adobe Printables will help with any difficulties in printing the bag pattern. Gypsy and bohemian fashions bring out a unique personal style. The following are a few ideas to help you find your inner hippie. The colors used for this bag were chosen to give the bag a natural look. Feel free to substitute brighter colors to match outfits in your closet. Other beads can be substituted for the pony beads as long as the center holes are large enough to thread all the strands. Fringe lengths can be adjusted to personal preference. A recycled belt from the thrift store was used for the handle, but leather handles from old purses are wonderful alternatives. A smaller or larger bag can easily be made. For smaller, simply adjust the number of rounds used and, if desired, change which rounds the beads are attached to. For a larger bag follow the repeat pattern of rounds until the bag is as large as needed. Expand your boho chic wardrobe with quick to make accessories. Nothing says gypsy like beaded hemp jewelry or a flower crown.